Warrenton, Oregon ~ 2018 ~ Come join us! Chamber of Commerce and the Chamber Ambassadors. Warrenton appears to be the next hot spot for North Coast development. Most of the easy to improve land in Astoria and Seaside have already been developed. Warrenton, one of the largest cities in the state by acreage, is rich in available residential, commercial, and industrial property. There are hundreds of homes in the planning stages, enough to supply residential demand for the next two or three economic cycles. Warrenton’s industrial property is ready to market, and its commercial district extends from the Young’s Bay Bridge to SE Dolphin Ave.
Warrenton is a natural place for vigorous commercial development. Major retailers like Fred Meyer, Costco, and Home Depot have already chosen it as their preferred sight. Centrally located in our market, with all of the major highways converging here, Warrenton will likely become the predominant city on the North Coast. Warrenton’s commercial district currently attracts customers from Cannon Beach to Ocean Park. Marlin Avenue was the first cross street on Highway 101 to experience major commercial development. This occurred even before the lighted intersection was added. The increased traffic should further cement its position as an important commercial district in Warrenton. Gannaway Bros. Jewelers (dba G B Jewelers) would prefer to rent their space to businesses in the financial services sector. With the Bank of the Pacific next door and the Bank of Astoria across the street, we hope to create a nucleus that will develop into a new financial district for the North Coast. Perhaps one day, people will have all of their financial needs met just by turning north on Marlin Avenue. That said, we will entertain any all requests for our rental units. 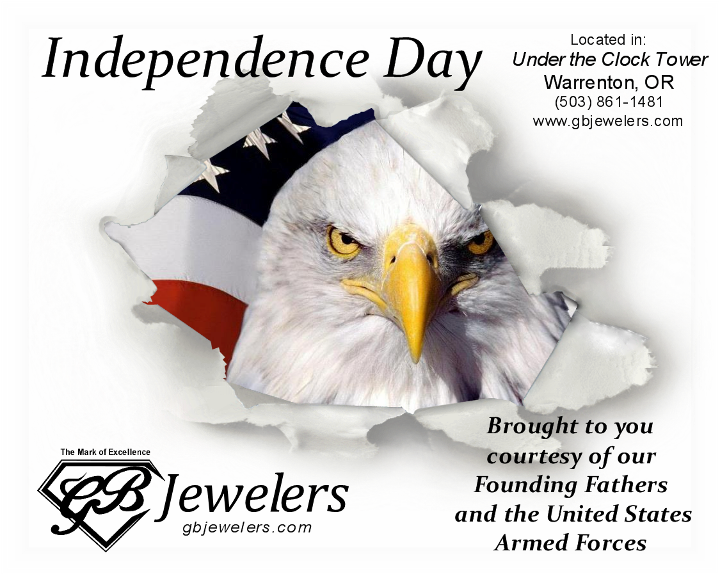 Why lease from Gannaway Bros. Jewelers? Gannaway Bros. Jewelers currently owns one of the premier properties on Marlin Ave. It is the first property north of the light that has easy access from Marlin Ave. The street that comes out of the Fred Meyer parking lot feeds directly into our driveway. 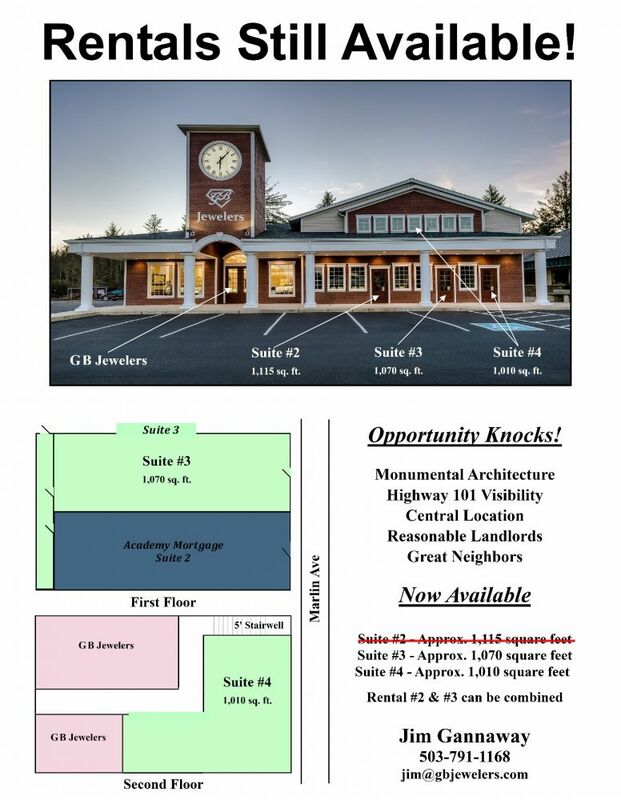 Our property has visibility from traffic traveling both ways on Highway 101. No other property on Marlin Avenue offers such a unique package of visibility and access. Lease from Gannaway Brothers Jewelers and your landlord will be local. If you have a problem, all you have to do is walk next door and you can talk to Tim or Jim face to face. We will be occupying the same building. Obviously, we would have a mutual interest in maintaining our property, as well as promoting harmonious relationships with our neighbors. The Gannaway brothers are still old fashioned enough to believe in the golden rule “Do unto others as you would have them do unto you”. This basic philosophy will guide our relationship with our tenants. Store Hours: 10:00 a.m. - 6:00 p.m.
We are closed on Christmas Day and on New Years Day every year.